Ever feel overwhelmed? I mean, losing your marbles? Too much going on…can’t cope? 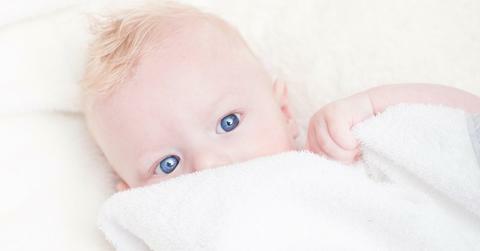 Can you believe (scientists think) that baby’s eyesight develops slower than the rest of her senses to help her cope? Yup. Nature gave her a better coping mechanism than yoga, a hot tea (or a glass of wine). Apparently, when a baby is born, her sense of smell, touch, taste and hearing are all much stronger than her sense of sight. Many scientists think this is because humans mainly use sight to learn and react with the world around us. So, When Can She See Colour? As an artist who paints wall murals, I was pretty curious when I could start teaching Audrey about colour. Well, around 6-8 months old, your baby will be able to see almost like you. Audrey’s 8 months old now – perfect timing! I was looking for a game to play with Audrey that would help her develop her sense of sight – since she’s the right age now. So I put a basket together of coloured items. Maybe 3 or 4 items in each colour – red, blue + yellow (primary colours) and green, orange + purple (secondary colours). The items are things like toys, cloths, instruments and other odds and ends. We’ve been going to KinderMusik since Audrey was 7 weeks old. Miss Kendra taught us to always label everything you show your baby. I choose a colour (red for example) and introduce one item at a time. 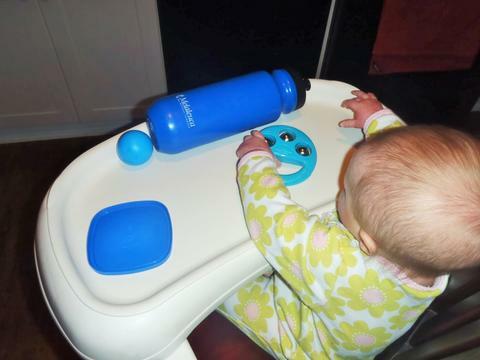 Audrey explores each item. She gets a red ball, red tissue, red towel and a red plastic lid from my kitchen. 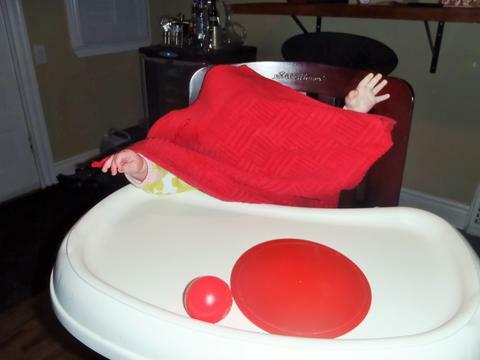 We play peek-a-boo under the red towel, eat the red lid and crumple the red tissue. By the end of the first colour, Audrey has a table full of red items to play with. It’s A Game For The Other Senses Too! On to blue…she jingles her blue bells (sense of sound). Then I fill a blue water bottle with water. We swish it around so she hears the water inside (sense of sound). Then I drip some water onto her hand so she can feel the cold liquid (sense of touch). 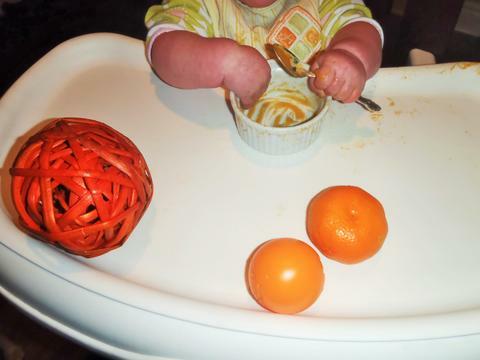 I roll the orange ball around the highchair table to grab at, helping her hand-eye coordination. At the very end, I give her green peas or orange sweet potato in a bowl. She grabs it with her hands, mushing it up (feeling all the squishy goodness and helping her sense of touch) and puts it in her mouth (helping her sense of taste…and probably sense of smell, too). 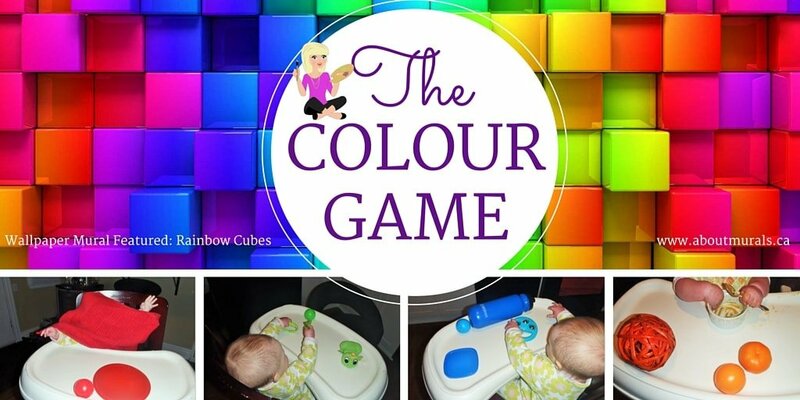 I’d love to hear what colourful items you add to this game and how your baby reacts. Let me know how it goes in the comments below.